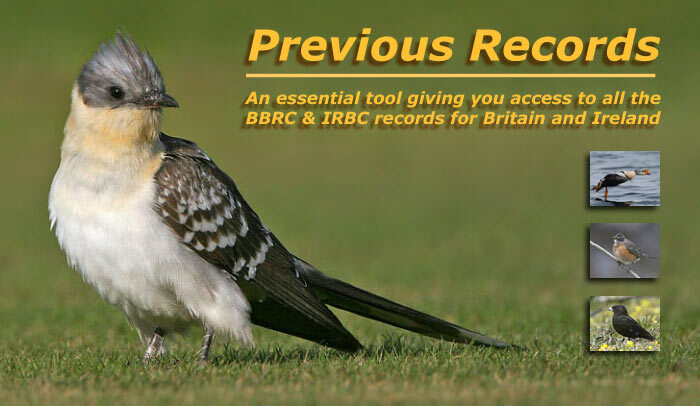 Our Previous Records database contains all the 35,000+ accepted records of rarities published to date by the British Birds Rarities Committee (BBRC) and the Irish Rare Birds Committee (IRBC). All British Birds Rarity Committee (BBRC) records up until the end of 2016 and Irish Rare Birds Committee (IRBC) records up until the end of 2015 are in the database. In addition, we have included some records of birds in the period covered that have not been submitted or have been submitted and are pending. Historically there have always been records that were not submitted for a variety of reasons, and unfortunately many of these reports may never now be adjudicated. However in recent years it has become much easier to publish good evidence of an occurrence, such as photos in magazines or online. Fortunately most such records are then submitted to the appropriate rarities committee, but in a few instances some are not. Where such evidence is published in the public domain, and the sighting refers to a year for which the records committee has already published then we may choose to include such records here, with reference to source and with the status "not submitted / pending". Obviously they do not constitute an official record as such, and we urge anyone who has seen such a bird to contact the appropriate body with details of the sighting. Please see the links below. * Records of birds not yet published. * Records that were published as “not proven”, colloquially often referred to as “rejected” records. * Records that were not submitted, apart from some exceptions noted above. Know of a record not here? submit it! Near the top of each species page, the "at a glance" section shows the official current BBRC or IRBC published estimate of individuals to have occurred. Further down each page we show the details for each record as per any filter you have set - eg Yorkshire, or 1990-2006 or other. What is returned is every published record that matches your filter, plus at the top of each graph and chart we tell you how many such records are shown / analysed. Note, however, that this total is not the same as the number of individual birds. For instance: some records are for returning birds from previous years (but not necessarily to the same county), some records are for flocks, and some are for birds also recorded elsewhere, eg in neighbouring counties. Thus a record of a individual in Yorkshire also recorded in County Durham, will be included in County Durham and Yorkshire records. The BBRC total however will reflect that they were deemed to have been the same bird. Thus the BBRC and IRBC totals shown are the definitive ones. In our news reports, Rare Bird Alert categorise birds based upon their occurrence in the most recent 5 years. A species status is weighted by a combination of how frequently a species occurs and how difficult it has been to "connect" with this species. Please let us know if you have any problems using Previous Records or spot any errors.